If you dream of starting an embroidery business or expanding the possibilities of your home embroidery, then the PR670 embroidery machine is for you! 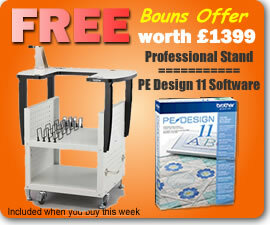 Fantastic deal this week, FREE professional stand (RRP £399) and with an option to add at no extra cost PE Design 11 software (RRP £999) or the Cap Frame kit (RRP £1079) dont miss out..! Why choose the Brother PR670? The wait is over!... Now the PR range of embroidery machine has been brought up to speed with Industrial standard acceleration. The new PR670 manufactured by Brother can accelerate from zero to 1000 stitches per minute in just 4.7 seconds. What that means is up to a 10% reduction in embroidery time that converts to greater efficiency, higher turnover and more profits. Brother is a well known and trusted company who produce a wide range of sewing machines for both industrial and home fashion use. The PR-670 combines Brother's expertise from both of these markets. The resulting embroidery machine has many high end features, such as automatic needle threading, LED pointer for precise design positioning, many hoop options including the popular cap frame and now the additional shoe frame. It is user friendly with features such as built-in help on the full colour HD screen. This winning combination makes it ideal for use in education and for start up home business. Presently we can offer 18 months 0% FINANCE OPTION and low rate 48 months finance starting as low as only £40 per a week..! Apply on-line by using the link and your new Brother PR670 could be whith you in just a few days. The Brother PR670 uses six needles to sew embroidery designs or motifs. Can you imagine how much quicker this machine is over a single needle embroidery machine..! It's simple to use and we will teach you how to use it. Embroider caps, shirts, jackets, jeans, napkins, robes, hats or towels with business logos, school names, monograms, decorative motifs and more. As one of our images shows the new LED pointer shows you precisely where the needle will drop. Making perfect pattern placement as easy as touching a few buttons on the LCD screen. Allowing you to position jobs faster and more accurately than ever. The PR670 is equipped with a new frame sensors to allow the use of even more frame types such as the round frame kit and the new clamp frame kits. The clamp frame kits make it easy to embroider shoes, football boots, inner jacket pockets, cuffs, gloves, bags and much more. Using the on-screen editing functions you can built your very own custom designs and add lettering, select from one of the 37 built-in font styles available. You can download embroidery designs from the internet and sew them out on this machine. Simply plug your USB memory stick into the PR670 view the designs on its 10" HD LCD screen, then sew it out. It's easy to embroider names and words etc. now even on sports shoes as well baseball caps. The Screen is an upgrade to the previous PR655 model, now you can view your creations in crisp, vivid colour and navigate easily with the scrolling menu and large, intuitive icons. There are 16.7+ MILLION possible colours and an adjustment feature that allows you to change the brightness of the screen. The automatic colour change feature allows you to pre-program the correct thread colour sequence for the entire design. Create professional results in a compact, easy-to-use package. Embroider a wide variety of items such as shirts, jackets, jeans, totes or towels with business logos, school names, monograms, decorative motifs and more. This machine will stop snip its own thread ends, automatically thread its own needles. Choose the ideal embroidery frame for the job from the four different sizes included with the PR-670 (200mm x 300mm, 130mm x 180mm, 100mm x 100mm, 40mm x 60mm). Other optional add-ons which are popular and often sold with the PR670; Brother digitizing software also the useful base ball cap frame and the cylinder frame, both have particular uses which give this embroidery machine the ability to grow with you as new requirements arise. 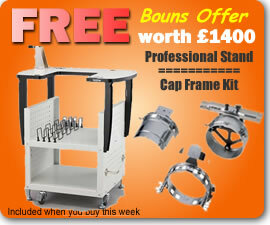 Also popular is the heavy duty stand with it's roller wheels and storage for hoops etc. Peace of mind...! Because of its low investment cost compared to other professional multi-needle embroidery machines and its ease of use, the PR670 is ideal for out-workers to make money while embroidering or for schools or use this machine as your own personal embroidery machine for superb quality embroidery results FAST..! The Brother PR embroidery machines are essentially a standalone business, you buy on and that's it, your set all you need to do is find customers. Your customers could be anything from Schools and Colleges to Sports Clubs or Businesses. Purchasing Garments in bulk from a clothing manufacturer is easy and with the Brother PR embroidery machines embroidering them is also easy. Yes this machine is not cheap when compared to other domestic machine but compared to a multi head industrial embroidery machine this is way under budget. I like to think that the best way to think about the recouping the cost is by finding your first customer. Just one school, one business, one sports club is all it takes. Please take a look below for a general idea of possible costs and approximate profits to be made. This is no gimmick customers of ours literally buy one of these machines and suddenly their working from themselves and what I tend to find is they come back for second Brother PR once business is booming it is honestly as simple as that. We also have fully trained engineers who service and repair the Brother PR machines nationwide. For more information regarding our service and repair prices don't hesitate to contact us. How would you rate this Brother PR670e Industrial 6-Needle Embroidery Machine?